A recent and wildly popular chart created by author and consultant Kim Goodwin presumes to graphically resolve the question "Am I mansplaining?". The chart is educational, funny and somewhat controversial. To get a sense of Ms. Goodwin's views on gender, one need only read her remark that "... men are by definition not targets of sexism." Apparently the existence and common use of the term "mansplaining" isn't sufficient contradicting evidence. 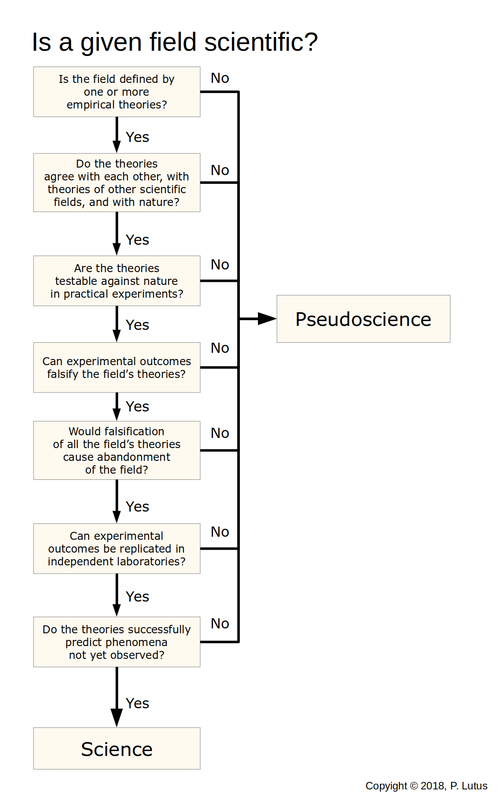 The above flowchart criteria reflect contemporary standards by which fields are determined to be scientific — standards expressed in technical definitions1,2, legal rulings3,4 and other sources. Some may wonder why a field's scientific standing should be assessed in this way — is there a social cost to allowing fields to define themselves as science without acceptance of commonly agreed standards? Well, yes, there is — many modern problems arise from the inadvertent or deliberate confusion of science and pseudoscience. For example, in the field of medicine, treatments must be evaluated scientifically, with regard both to efficacy and safety, in advance of their introduction into health clinics. In another example, to be accepted by a U.S. court of law, expert testimony must have a demonstrated scientific basis (this is the Daubert Standard). Before moving on I want to answer a question I often hear from students: whether all fields must be partitioned into either science or pseudoscience. The answer is no — sciences are clearly defined, and many very worthwhile fields are neither science nor pseudoscience (art, literature, music). The term pseudoscience is reserved for fields that pretend to be science but that fail one or more of science's requirements. One recent example of pseudoscience is Creationism, a religious movement recently relabeled "Intelligent Design" but with no substantive change in content. It's pseudoscience because it postures as science but without meeting science's requirements. This is an example where the distinction between science and pseudoscience is crucial — without that distinction, purely religious beliefs would be presented as science in public school classrooms. Another example of pseudoscience is modern-day psychology, for the reason that, in spite of its self-definition as science, it has no scientific theories to define and unify the field and link it to other sciences, in the way that relativity and quantum mechanics define physics and evolution and natural selection define biology. This example is especially tragic because of the sequence of public catastrophes that have appeared over time in the guise of psychological science. But over the next 20 years the psychology-as-science controversy will evaporate as neuroscience (scientific study of brain and nervous system) entirely replaces psychology (study of mind and behavior), in much the same way that astronomy replaced astrology and chemistry replaced alchemy. In each of these examples a legitimate science appeared and replaced an imitation. I want to add that many people find psychology to be very useful, both as a source of insight into human behavior and for therapeutic reasons. The problems that plague the field primarily result from its deplorable confusion with science. Without that confusion, there would be little controversy, many satisfied clients, and no virgins falsely persuaded they had been raped by innocent family members. No mentally ill people turned into vegetables either by misguided surgical procedures or ineffective drugs. No young people stigmatized by bogus diagnoses having little connection with reality. Astrology doesn't have these kinds of problems, and many people find it very useful. But no one confuses astrology with science. Here's a table that concisely summarizes various fields, their scientific standing and the reasoning behind the categorization. Astrology No Theories conclusively falsified, field replaced by astronomy. Alchemy No Theories conclusively falsified, field replaced by chemistry. Psychology No No falsifiable empirical theories. Neuroscience Yes Empirical because of its study of the brain and nervous system, able to craft and test falsifiable theories. Biology Yes Well-tested theories that both unite the field and link it to other scientific fields. Physics Yes Powerful, well-tested and very accurate theories that both unite the field and link it to other scientific fields. Mathematics No A field very important to all sciences, but not science because (a) no empirical content and (b) the ability to establish a statement as true in perpetuity. Many students are surprised by the fact that, in spite of its central role and great importance to science, mathematics is not itself regarded as a science for a number of reasons including its lack of empirical connections. (Mathematical ideas are tested and sometimes falsified, but those tests aren't carried out with respect to nature.) Also, unlike scientific theories, any of which can be falsified by new evidence in perpetuity, a mathematical theory (a conjecture), once shown to be true, remains true forever (a theorem). A relatively recent philosophical movement, more accurately titled deconstructive postmodernism, asserts that all human experiences are irreducibly solipsistic (limited to one individual), and what people regard as commonly shared knowledge and experience are mere illusions. Postmodernism bears on the definition of science in the following way: if the postmodern thesis is true, then science can't be given a general, uniform definition — there must be as many definitions of science as there are individuals. But apart from its relevance to science, postmodernism contains the seeds of its own destruction — if the postmodern thesis is valid, it must first be applied to itself and therefore cancels by self-reference (i.e. there can't be a shared philosophical position that asserts the impossibility of shared philosophical positions). But this glaring paradox doesn't seem to affect the number of words published on the topic, or the frequency of debates (debates whose very existence undermines the thesis under discussion). He: "You don't seem to be taking this debate very seriously." Me: "On the contrary — I've taken it as seriously as possible, given the premise." He: "What do you mean?" Me: "Your argument asserts that postmodernism is a legitimate philosophical position, therefore there's no shared objective reality. It follows that we can't arrive at a shared position, an 'agreement,' in fact I can never be more than a figment of your imagination, so I don't understand why you care what I think." My point in this section is to assert another property of science — it presumes and requires the existence of a shared, objective reality, a reality that we test with our theories and experiments.